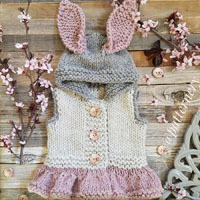 Go to original pattern for design DROPS Baby 14-1. 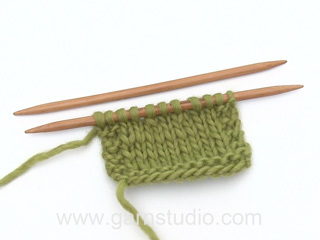 Knitting tension: 14 sts x 18 rows on needle size 6mm with 3 strands of Alpaca in stocking stitch = 10x10cm. PONCHO: Start at the top and knit down and outwards. Cast on 54-56-58 (60-62) sts on circular needle size 6mm with 1 strand of each Alpaca colour (= 3 strands). Insert a marking thread between the 2 middle sts (= mid back). Knit 2 rows garter sts back and forth on needle from mid front (= end of rows), continue knitting back and forth (= slit mid front) as follows: Knit stocking sts with the 2 outermost sts each side (mid front) in garter sts. At the same time, increase 4 sts on every other row (= from the right side) as follows: knit 4, 1 yo, 1 yo on each side of the middle 8 sts and 1 yo when there are 4 sts left on needle. On next row, knit yo’s to create holes. When piece measures 6-7-8 (9-10) cm, discontinue the slit and continue round on needle – knit all sts. Continue the increases on every other round, i.e. on each side of the middle 8 sts back and front. When there are 138-148-158 (168-178) sts on round, purl 1 round, knit 1 round whilst inc 1 st in every 4th st on round. On next round, cast off in purled sts. 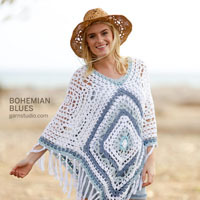 Crochet borders: Using Eskimo and crochet hook size 8, crochet a border round lower edge of poncho as follows: 1 dc in 1st st, *4 ch, 1 tr in the 1st of the 4 ch just crochet, skip 3 sts, 1 dc in next st*, repeat from *-*, and finish with 1 sl st in 1st dc. Crochet as follows round neck and along slit mid front (begin at top left side of slit): 1 dc in 1st st, *1 ch, skip 2 sts/rows, 1 dc in next st/row*, repeat from *-* and finish with 1 sl st in 1st dc. Continue round neck (not slit) as follows: 1 dc in 1st st, *4ch, 1 tr in the 1st of the 4 ch just crochet, skip 1 ch, 1 dc in next ch*, repeat from *-*. 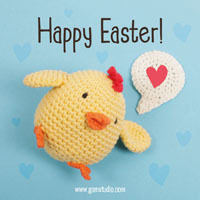 Crochet a ch-string approx 60-65-70 (75-80) cm long and pull through the 1st crochet round at neck. Make 2 small pompoms in Eskimo and attach to ch-string. Crochet tips: Replace 1st tr on each round with 3 ch. Crochet the hat from top down. 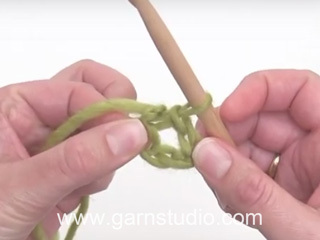 Crochet 6 ch and form a ring with a sl st.
1st round: 10 tr in ch-ring – see Crochet tips! 5th round: Continue with 1 tr in each tr and 1 tr in each ch, but crochet 2 tr in 0-2-4 (6-8) tr evenly distributed on round = 30-32-34 (36-38) tr. Now crochet 2-3-3 (4-4) rounds with 1 tr in each tr. Crochet next round as follows: 1 dc in 1st tr, *2 ch, skip 1 tr, 1 dc in next tr*, repeat from *-* and finish with 1 sl st in 1st dc from beginning of round. Cut the thread. 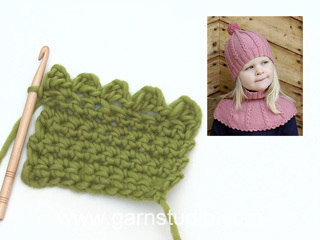 The hat measures approx 15-17-17 (19-19) cm from top to bottom edge. Knitting tension: 26 sts x 34 rows on needle size 2.5mm with Alpaca in stocking stitch = 10 x 10cm. 26 sts x 52 rows on needle size 2.5mm with Alpaca in garter sts = 10 x 10 cm. Knit the sock back and forth from mid back. Cast on 48-52-56 (56) sts using needle size 2.5mm and 2 strands of Alpaca. 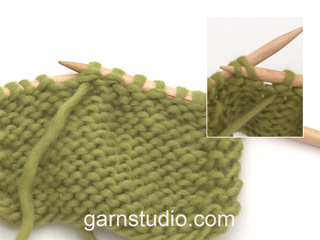 Remove 1 strand and knit 5-6-6 (7) cm Rib – adjust so that the next row is from the wrong side. Purl 1 row, at the same time decreasing 14-14-18 (14) sts evenly on row = 34-38-38 (42) sts. With row of holes: Knit next row as follows from the right side: K1, *K2 tog, yo*, repeat from *-* and finish with K1. Purl 1 row from wrong side. Without row of holes: K 1 row from right side and purl 1 row from wrong side. Now put the outermost 12-13-13 (15) sts each side on a thread. Knit 4 - 4.5 - 5.5 (6.5) cm stocking sts over the middle 10-12-12- (12) sts. Put sts from thread back on needle and pick up 10-11-13 (16) sts on each side of middle piece = 54-60-64 (74) sts. Knit 3 – 4 –5 (5) cm stocking sts over all sts, at the same time after 1.5 – 2 – 2.5 (3.5) cm decreasing on every other row until finished measurements as follows: Dec 1 st at the beginning and end of row and K2 tog on each side of the 2 middle sts. Cast off and sew seam at bottom of foot and up mid back. Pull silk ribbon or similar through row of holes. Crochet border: Using Alpaca and crochet hook size 2.5, crochet a border at the top of sock as follows: 1 dc in 1st st, *3 ch, 1 tr in the 1st of the 3 ch just crochet , 1 dc in each of the next 3 sts*, repeat from *-* and finish with a sl st in dc from beginning of round.